"At a board of directors meeting on February 22, 1924, the assets of Edward Miller and Company, ’property, good will and business as a going concern,’ were formally transferred to ’The Miller Company, a Connecticut corporation..."
—Scheips, Marguerite T. (Research by Allen L. Weathers). (1995). The Miller Company: The first 150 years, (p. 52). Miller Company: Meriden, CT.
"New issue, $800,000, The Miller Company... Dated March 1, 1924, Due March 1, 1934. HISTORY AND BUSINESS: The Miller Company organized under the laws of Connecticut, upon completion of the present financing will own the business and assets of Edward Miller & Company of Meriden, Connecticut. Business founded in 1844, one of the oldest and best known manufacturers of lighting fixtures. Manufactures a large variety of electric fixtures, gas fixtures, kerosene lamps and other products. Will own the patents and control the production of the well known Duplexalite fixture the sales of which were formerly controlled by the General Electric Company. Also manufactures the Miller Daylight Kitchen Unit and Miller Portable Lamps. The large customers include the Western Electric Company, Inc.; Westinghouse Electric & Manufacturing Company; most of the General Electric Company’s distributors; various Standard Oil Companies; Commonwealth Edison Company, Chicago; Consolidated Gas Co. of New York; United Electric Light & Power Co., New York; Union Electric Light & Power, St. Louis; The Philadelphia Electric Co.; Edison Electric Illuminating Company of Boston; Hartford Electric Light Company and many similar companies...."
(3 March 1924). "New co. heads lighting experts, All have taken leading part in illumination, brief sketches, introduction of men who will conduct business of big new concern". Meriden Morning Record, pp. 1 & 2. (Viewed 12 September 2017. G00364-74). Edward Miller & Co. (3 March 1924). Advertisement: "Beautiful and Useful— a Miller Desk Lamp..." Meriden Morning Record, p. 7, column 1. (Viewed 12 September 2017. G00280). Miller Company. (3 March 1924). Important bond offer announcement via advertisement. Meriden Morning Record, p. 7, columns 5-8. (See excerpt at top of this webpage. Viewed 12 September 2017. G00281-83). Miller Company. (1924). Duplex-A-Lite. The light to live with. Approx. 8 pp. (Viewed 28 June 2018. A03006; AAA03376-23). National Museum of American History library, Smithsonian Institution, Washington, DC, record id no. SILNMAHTL_31367 (bundled and unspecified entry). Miller Company. (1924). [Duplex-a-lite]. Number of pages unknown. Viewed 2 June 2016. Offline- University of California, Santa Barbara library, Special Coll., Romaine Trade Catalogs. Miller Company. (1924). [Miller fixtures (catalog no. 150)]. Meriden, CT. Number of pages unknown. Viewed 7 January 2017. Offline - University of California, Santa Barbara, Special Coll., Romaine Trade Catalogs. Miller Company. (1924). [Price list - Miller fixtures]. Meriden, CT. Number of pages unknown. Viewed 7 January 2017. Offline - University of California, Santa Barbara library, Special Coll., Romaine Trade Catalogs. St. Lawrence County Utilities Inc., presumably Ogdenburg, NY. (21 October 1924). Advertisement: "The Miller Lamp..." [with graphical illustration]. The Ogdenburg Republican- Journal (Ogdenburg, New York), p. 3, cols. 1-4. (Viewed 14 October 2018. B01073). St. Lawrence County Utilities Inc., presumably Ogdenburg, NY. (18 November 1924). Advertisement: "... Miller Lamps... " [with illustration]. The Ogdenburg Republican- Journal (Ogdenburg, New York), p. 10, cols. 1-3. (Viewed 14 October 2018. B01074). Herman H. Wolter, assignor to the Miller Company. (13 May 1924; filed 5 March 1924). Design no. 64,649; serial no. 8836: Design for a lighting-fixture pan. (Viewed 30 April 2018. AAA02782). Herman H. Wolter, assignor to the Miller Company. (15 July 1924; filed 19 May 1924). Design no. 65,207; serial no. 9639: Design for a lantern. (Viewed 30 April 2018. AAA02783). Herman H. Wolter, assignor to the Miller Company. (15 July 1924; filed 19 May 1924). Design no. 65,208; serial no. 9641: Design for a canopy for lighting fixtures. (Viewed 30 April 2018. AAA02784). Herman H. Wolter, assignor to the Miller Company. (15 July 1924; filed 19 May 1924). Design no. 65,209; serial no. 9642: Design for a lighting-fixture body. (Viewed 30 April 2018. AAA02785). Herman H. Wolter, assignor to the Miller Company. (15 July 1924; filed 19 May 1924). Design no. 65,210; serial no. 9644: Design for a bobesche. (Viewed 30 April 2018. AAA02786). Herman H. Wolter and Guy P. Norton, assignors to the Miller Company. (15 July 1924; filed 19 May 1924). Design no. 65,211; serial no. 9646: Design for a lamp base. (Viewed 25 March 2018. AAA01542). Herman H. Wolter, assignor to the Miller Company. (30 September 1924; filed 19 May 1924). Design no. 65,713; serial no. 9640: Design for a lighting-fixture body. (Viewed 30 April 2018. AAA02787). Herman H. Wolter, assignor to the Miller Company. (30 September 1924; filed 19 May 1924). Design no. 65,714; serial no. 9643: Design for a backplate for lighting fixtures or similar articles. (Viewed 30 April 2018. AAA02788). Herman H. Wolter, assignor to the Miller Company. (30 September 1924; filed 19 May 1924). Design no. 65,715; serial no. 9645: Design for a backplate for lighting fixtures or similar articles. (Viewed 30 April 2018. AAA02789). Herman H. Wolter, assignor to the Miller Company. (14 October 1924; filed 20 August 1924). Design no. 65,791; serial no. 10,499: Design for a lighting fixture. (Viewed 30 April 2018. AAA02790). Royal Ontario Museum, Toronto, call no. TP746 .M55 1900z. "Stores and showrooms; New York, 68 and 70 Park Place; Philadelphia, 706 Perry Bldg; Chicago, 116 South Michigan Boulevard." Metropolitan Museum of Art, New York, accession no. 61.671.11. Miller Company. (5 March 1925). Advertisement: "The wonderful new Duplex-a-lite fills a room with cheerful sunshine..." Meriden Record, p. 7, column 7. (Viewed 11 September 2017. G00273). St. Lawrence County Utilities, Inc., presumably Massena, NY. (June 1925). Advertisement: "... Table Lamps... Miller Lamp... " The Massena Observer, (Massena, New York). (Viewed 23 October 2018. D00390-91). Online - NYS Historic Newspapers: 18 June 1925, p. 14, cols. 5-8; 25 June 1925, presumably p. 12, cols. 5-8. Miller Company. (3 November 1925). Advertisement: "Miller Lighting Fixtures, Beautifully designed and finished, extremely moderate in price..." Meriden Record, p. 7, column 7. (Viewed 10 September 2017. G00274). C. A. Muddiman Co., Washington, DC. (30 December 1925). Advertisement: "... Complete stock of Miller Oil Heaters... " [with possibly relevant illustration]. Evening Star (Washington, DC), presumably p. 10, cols. 5-6. (Viewed 21 October 2018. B01177). Herman H. Wolter, assignor to the Miller Company. (28 April 1925; filed 27 February 1924). Design no. 67,174; serial no. 8751: Design for a lighting fixture. (Viewed 30 April 2018. AAA02791). Herman H. Wolter, assignor to the Miller Company. (28 April 1925; filed 27 February 1924). Design no. 67,175; serial no. 8752: Design for a lighting fixture. (Viewed 30 April 2018. AAA02792). Herman H. Wolter, assignor to the Miller Company. (28 April 1925; filed 27 February 1924). Design no. 67,176; serial no. 8756: Design for a lighting-fixture canopy. (Viewed 30 April 2018. AAA02795). Herman H. Wolter, assignor to the Miller Company. (28 April 1925; filed 27 February 1924). Design no. 67,177; serial no. 8758: Design for a lighting-fixture canopy. (Viewed 30 April 2018. AAA02796). Herman H. Wolter, assignor to the Miller Company. (28 April 1925; filed 27 February 1924). Design no. 67,178; serial no. 8763: Design for a lighting-fixture spindle. (Viewed 30 April 2018. AAA02797). Herman H. Wolter, assignor to the Miller Company. (12 May 1925; filed 27 February 1924). Design no. 67,323; serial no. 8755: Design for a canopy. (Viewed 30 April 2018. AAA02798). Herman H. Wolter, assignor to the Miller Company. (12 May 1925; filed 5 March 1924). Design no. 67,324; serial no. 8833: Design for a stand for bridge lamps. (Viewed 30 April 2018. AAA02799). Herman H. Wolter, assignor to the Miller Company. (12 May 1925; filed 5 March 1924). Design no. 67,235; serial no. 8834: Design for a table lamp. (Viewed 30 April 2018. AAA02800). Leroy C. Doane, assignor to the Miller Company. (28 July 1925; filed 30 March 1925). Design no. 67,833; serial no. 12,957: Design for a glass lighting bowl for bus ceilings and the like. (Viewed 14 March 2018. AAA01128). Herman H. Wolter, assignor to the Miller Company. (4 August 1925; filed 17 June 1925). Design no. 67,938; serial no. 13,801: Design for an arm for bridge lamps or the like. (Viewed 30 April 2018. AAA02793). Herman H. Wolter, assignor to the Miller Company. (4 August 1925; filed 17 June 1925). Design no. 67,939; serial no. 13,802: Design for a base for bridge lamps or the like. (Viewed 2 May 2018. AAA02856). Herman H. Wolter, assignor to the Miller Company. (11 August 1925; filed 19 June 1925). Design no. 67,987; serial no. 13,832: Design for a base for lamps or the like. (Viewed 30 April 2018. AAA02794). Leroy C. Doane, assignor to the Miller Company. (10 November 1925; filed 26 July 1921). Letters patent no. 1,560,547: Lighting fixture. (Viewed 13 April 2018. AAA01126). Corning Museum of Glass, Corning, NY, record no. 77344. University of Connecticut library, Storrs, CT, barcode no. B2433175. Miller Company (Duplex-a-Lite Division). (1926). The Duplex lighting system as applied to commercial requirements [catalogue no. D.P. 154]. Approx. 16 pp. (Viewed 28 June 2018. A03006; AAA03376-29). C. A. Muddiman Co., Washington, DC. (11 January 1926). Advertisement: "... Complete stock of Miller Oil Heaters... " [with possibly relevant illustration]. Evening Star (Washington, DC), p. 13, cols. 2-3. (Viewed 21 October 2018. B01178). Miller Company. (1 July 1926). Advertisement: "Miller Lighting Fixtures..." Meriden Record, p. 7, column 6. (Viewed 12 September 2017. G00275). Westchester Lighting Co., Tarrytown, NY. (6 November 1926). Advertisement: "... Charming new Miller Lamps are here... " [with four illustrations of lamps]. Tarrytown Daily News (Tarrytown, New York), presumably p. 2, cols. 5-8. (Viewed 23 October 2018. D00392). Leroy C. Doane, assignor to the Miller Company. (2 February 1926; filed 31 March 1925). Patent no. 1,571,578; serial no. 19,575: Shade support. (Viewed 18 March 2018. AAA01285). Leroy C. Doane, assignor to the Miller Company. (13 April 1926; filed 20 October 1924). Patent no. 1,580,711; serial no. 744,541: Holder for globes and the like. (Viewed 14 March 2018. AAA01130). Herman H. Wolter, assignor to the Miller Company. (8 June 1926; filed 27 February 1924). Design no. 70,349; serial no. 8764: Design for a lighting-fixture pan. (Viewed 1 May 2018. AAA02801). Herman H. Wolter, assignor to the Miller Company. (8 June 1926; filed 5 March 1924). Design no. 70,350; serial no. 8835: Design for a lighting-fixture plate. (Viewed 1 May 2018. AAA02802). Herman H. Wolter, assignor to the Miller Company. (8 June 1926; filed 15 April 1926). Design no. 70,351; serial no. 17,302: Design for a lantern. (Viewed 1 May 2018. AAA02803). Herman H. Wolter, assignor to the Miller Company. (8 June 1926; filed 15 April 1926). Design no. 70,352; serial no. 17,303: Design for a plaque for wall brackets. (Viewed 1 May 2018. AAA02804). Herman H. Wolter, assignor to the Miller Company. (8 June 1926; filed 15 April 1926). Design no. 70,353; serial no. 17,304: Design for a plaque for wall brackets. (Viewed 1 May 2018. AAA02805). Leroy C. Doane, assignor to the Miller Company. (17 August 1926; filed 17 September 1924). Patent no. 1,596,159; serial no. 738,146: Vaporproof lighting unit. (Viewed 14 March 2018. AAA01129). Herman H. Wolter, assignor to the Miller Company. (5 October 1926; filed 11 August 1926). Design no. 71,235; serial no. 18,685: Design for a lighting fixture. (Viewed 1 May 2018. AAA02806). Leroy C. Doane, assignor to the Miller Company. (2 November 1926; filed 25 February 1925). Patent no. 1,605,329; serial no. 11,442: Globe holder. (Viewed 15 March 2018. AAA01168). Leroy C. Doane, assignor to the Miller Company. (30 November 1926; filed 23 April 1925). Patent no. 1,609,111; serial no. 124,637: Bus lighting unit. (Viewed 15 March 2018. AAA01169). Miller Company (Ivanhoe Division). (1927). Ivanhoe lighting equipment. Commercial lighting section. Enclosing globes and fixtures for commercial illumination [catalogue no. 700]. Approx. 40 pp. (Viewed 28 June 2018. A03006; AAA03376-24). Helen J. Cummings, assignor to the Miller Company. (4 January 1927; filed 2 October 1926). Design no. 71,780; serial no. 19,229: Design for a glass globe. (Viewed 18 March 2018. AAA01286). Helen J. Cummings, assignor to the Miller Company. (4 January 1927; filed 2 October 1926). Design no. 71,781; serial no. 19,230: Design for a glass globe. (Viewed 18 March 2018. AAA01294). Leroy C. Doane, assignor to the Miller Company. (4 January 1927; filed 3 January 1925). Letters patent no. 1,612,856; serial no. 310: Lighting unit. (Viewed 18 March 2018. AAA01287). Herman H. Wolter, assignor to the Miller Company. (5 April 1927; filed 26 January 1927). Design no. 72,401; serial no. 20,504: Design for a lighting fixture. (Viewed 1 May 2018. AAA02807). Herman H. Wolter, assignor to the Miller Company. (5 April 1927; filed 26 January 1927). Design no. 72,402; serial no. 20,506: Design for a lighting fixture. (Viewed 1 May 2018. AAA02808). Herman H. Wolter, assignor to the Miller Company. (12 April 1927; filed 26 January 1927). Design no. 72,460; serial no. 20,508: Design for a wall bracket for lighting fixtures. (Viewed 3 May 2018. AAA02862). Herman H. Wolter, assignor to the Miller Company. (12 April 1927; filed 26 January 1927). Design no. 72,461; serial no. 20,503: Design for a backplate for lighting fixtures. (Viewed 3 May 2018. AAA02863). Herman H. Wolter, assignor to the Miller Company. (12 April 1927; filed 26 January 1927). Design no. 72,462; serial no. 20,505: Design for a wall bracket for lighting fixtures. (Viewed 1 May 2018. AAA02809). Herman H. Wolter, assignor to the Miller Company. (12 April 1927; filed 26 January 1927). Design no. 72,463; serial no. 20,507: Design for a wall bracket for lighting fixtures. (Viewed 1 May 2018. AAA02810). Richard M. Runge, assignor to the Miller Company. (19 April 1927; filed 27 February 1924). Patent no. 1,625,100; serial no. 695,487: Lamp support. (Viewed 18 March 2018. AAA01290). Leroy C. Doane, assignor to the Miller Company. (10 May 1927; filed 17 June 1925). Patent no. 1,628,395; serial no. 37,656: Floor lamp. (Viewed 18 March 2018. AAA01289). Sheldon S. Roby, assignor to the Miller Company. (10 May 1927; filed 27 February 1924). Patent no. 1,628,431: Automatic dipping machine. (Viewed 18 March 2018. AAA01292). Otto West, assignor to the Miller Company. (17 May 1927; filed 27 April 1925). Patent no. 1,629,243; serial no. 25,988: Lamp socket. (Viewed 18 March 2018. AAA01288). Leroy C. Doane, assignor to the Miller Company. (14 June 1927; filed 16 June 1925). Patent no. 1,632,391; serial no. 37,418: Shade holder. (Viewed 18 March 2018. AAA01293). Herman H. Wolter, assignor to Miller Company. (19 July 1927; filed 15 April 1926). Design no. 73,117; serial no. 17,305: Design for bobeche. (Viewed 5 February 2019. D00768). Herman H. Wolter, assignor to the Miller Company. (26 July 1927; filed 15 April 1926). Design no. 73,153; serial no. 17,306: Design for a lamp. (Viewed 1 May 2018; AAA02811). Herman H. Wolter, assignor to the Miller Company. (20 September 1927; filed 25 July 1927). Design no. 73,512; serial no. 22,864: Design for a lighting fixture. (Viewed 5 February 2019. D00769). Herman H. Wolter, assignor to the Miller Company. (11 October 1927; filed 11 August 1926). Design no. 73,631; serial no. 18,686: Design for a lantern. (Viewed 1 May 2018; AAA02812). Herman H. Wolter, assignor to the Miller Company. (11 October 1927; filed 11 August 1926). Design no. 73,632; serial no. 18,688: Design for a combined lighting-fixture ring and support. (Viewed 1 May 2018; AAA02813). Herman H. Wolter, assignor to the Miller Company. (25 October 1927; filed 11 August 1926). Design no. 73,732; serial no. 18,687: Design for a backplate for lighting fixtures. (Viewed 7 February 2019. E00570). Leroy C. Doane, assignor to the Miller Company. (27 December 1927; filed 17 September 1924). Patent no. 1,654,162; serial no. 738,148: Lighting fixture. (Viewed 18 March 2018. AAA01291). Online - Courtesy Canadian Centre for Architecture, Montréal, Québec / APT Building Technology Heritage Library. Columbia University, New York, call no. AT4100 M61 1927c. Columbia University, New York, call no. AT4100 M61 1927b. Columbia University, New York, call no. AT4100 M61 1927a. Columbia University, New York, call no. AT4100 M61 1920. Columbia University, New York, call no. AT4100 M61 1927. Columbia University, New York, call no. AT4100 M61 1920a. University of Connecticut library, Storrs, barcode no. B2433175. Leroy C. Doane, assignor to the Miller Company. (20 March 1928; filed 21 May 1925). Letters patent no. 1,662,853; serial no. 31,770: Holder for shades, reflectors, or the like. (Viewed 25 March 2018. AAA01515). Arthur B. Allworth, assignor to the Miller Company. (7 August 1928; filed 18 March 1925). Letters patent no. 1,680,078; serial no. 16,308: Lighting fixture. (Viewed 25 March 2018. AAA01514). Leroy C. Doane, assignor to the Miller Company. (7 August 1928; filed 23 April 1925). Letters patent no. 1,680,093; serial no. 25,192: Lighting fixture. (Viewed 25 March 2018. AAA01516). Leroy C. Doane, assignor to the Miller Company. (7 August 1928; filed 8 September 1926). Letters patent no. 1,680,094; serial no. 134,154: Lighting fixture. (Viewed 25 March 2018. AAA01513). Matthew Luckiesh, Leroy C. Doane, and Arthur Miller, assignors to the Miller Company. (4 September 1928; filed 8 November 1926). Letters patent no. 1,682,918; serial no. 146,881: Shade holder. (Viewed 25 March 2018. AAA01517). Corning Museum of Glass, Corning, NY, call no. : Lighting: Miller Company, Meriden, CT, USA (F-9081LG). Miller Company (Duplex-a-Lite Division). (c. 1928). Duplex-a-Lite for use in the home [catalogue no. D.P. 165]. Approx. 23 pp. (Viewed 28 June 2018. A03006; AAA03376-28). Arthur B. Allworth, assignor to the Miller Company. (15 January 1929; filed 26 June 1925). Letters patent no. 1,698,708; serial no. 39,645: Lighting fixture. (Viewed 25 March 2018. AAA01521). Leroy C. Doane, assignor to the Miller Company. (5 February 1929; filed 4 October 1922). Letters patent no. 1,701,175; serial no. 592,417: Holder for shades or reflectors. (Viewed 25 March 2018. AAA01522). Leroy C. Doane, assignor to the Miller Company. (5 February 1929; filed 11 December 1924). Letters patent no. 1,701,176; serial no. 755,178: Dustproof closure for lighting units. (Viewed 25 March 2018. AAA01519). Leroy C. Doane, assignor to the Miller Company. (26 February 1929; filed 23 June 1926). Letters patent no. 1,703,482; serial no. 117,978: Swivel joint. (Viewed 25 March 2018. AAA01534). Leroy C. Doane, assignor to the Miller Company. (9 April 1929; filed 15 April 1927). Letters patent no. 1,708,084; serial no. 184,020: Stencil and process of making the same. (Viewed 25 March 2018. AAA01528). Leroy C. Doane, assignor to the Miller Company. (30 April 1929; filed 21 December 1925). Letters patent no. 1,711,263; serial no. 76,620: Theater lighting apparatus. (Viewed 25 March 2018. AAA01529). Leroy C. Doane, assignor to the Miller Company. (30 April 1929; filed 23 June 1926). Letters patent no. 1,711,264; serial no. 117,979: Shade holder. (Viewed 25 March 2018. AAA01532). Leroy C. Doane, assignor to the Miller Company. (8 October 1929; filed 9 December 1925). Letters patent no. 1,730,810; serial no. 74,309: Lighting fixture. (Viewed 25 March 2018. AAA01535). Leroy C. Doane, assignor to the Miller Company. (29 October 1929; filed 27 May 1925). Letters patent no. 1,733,586; serial no. 33,089: Shade holder. (Viewed 25 March 2018. AAA01533). Leroy C. Doane, assignor to the Miller Company. (19 November 1929; filed 25 February 1927). Letters patent no. 1,735,997; serial no. 170,844: Lighting fixture. (Viewed 7 February 2019. E00571). Leroy C. Doane and Albert B. Megraw, assignor to the Miller Company. (31 December 1929; filed 25 February 1927). Letters patent no. 1,741,408; serial no. 170,843: Chandelier. (Viewed 25 March 2018. AAA01520). Offline - University of California Santa Barbara library, Special Collections, Romaine Trade Catalogs. (29 June 1930). Meriden [with mention of the Miller Company]. Hartford Courant, p. E19. (Viewed 3 November 2018. D00515). Leroy C. Doane, assignor to the Miller Company. (14 January 1930; filed 13 April 1928). Letters patent no. 1,743,846; serial no. 269,653: Dustproof lighting unit. (Viewed 25 March 2018. AAA01536). Leroy C. Doane, assignor to the Miller Company. (14 January 1930; filed 11 December 1924). Letters patent no. 1,743,847; serial no. 755,177: Vibrationproof lighting unit. (Viewed 25 March 2018. AAA01518). Leroy C. Doane, assignor to the Miller Company. (14 January 1930; filed 9 March 1927). Letter patents no. 1,743,848; serial no. 173,832: Lighting unit. (Viewed 25 March 2018. AAA01530). Leroy C. Doane, assignor to the Miller Company. (11 February 1930; filed 20 July 1927). Letters patent no. 1,746,339; serial no. 207,086: Inclosed lighting fixture. (Viewed 25 March 2018. AAA01531). Leroy C. Doane, assignor to the Miller Company. (11 February 1930; filed 14 April 1928). Letters patent no. 1,746,340; serial no. 270,081: Dustproof for reflectors. (Viewed 25 March 2018. AAA01537). Leroy C. Doane, assignor to the Miller Company. (18 March 1930; filed 27 May 1925). Letters patent no. 1,751,311; serial no. 349,631: Shade holder. (Viewed 25 March 2018. AAA01538). Albert B. Megraw, assignor to the Miller Company. (17 June 1930; filed 23 April 1927). Letters patent no. 1,764,112; serial no. 185,967: Lighting fixture. (Viewed 25 March 2018. AAA01127). , assignor to the Miller Company. (17 June 1930; filed 9 March 1927). Letters patent no. 1,764,393; serial no. 173,831: Lighting fixture. (Viewed 25 March 2018. AAA01540). Leroy C. Doane, assignor to the Miller Company. (17 June 1930; filed 13 April 1928). Letters patent no. 1,764,394; serial no. 269,651: Shade holder. (Viewed 25 March 2018. AAA01539). Leroy C. Doane, assignor to the Miller Company. (17 June 1930; filed 8 August 1929). Letters patent no. 1,764,395; serial no. 384,353: Lighting fixture. (Viewed 25 March 2018. AAA01541). Columbia University, New York, call no. AT4100 M61 1930a. Columbia University, New York, call no. AT4100 M61 1930. Also see Smithsonian, National Museum of American History, call no. mfc 000535n. Leroy C. Doane, assignor to the Miller Company. (13 January 1931; filed 26 February 1929). Letters patent no. 1,788,945; serial no. 342,797: Shock absorber for lamp sockets. (Viewed 25 March 2018. AAA01524). Leroy C. Doane, assignor to the Miller Company. (3 March 1931; filed 8 August 1929). Letters patent no. 1,794,837; serial no. 384,352: Lighting fixture. (Viewed 25 March 2018. AAA01525). Guy P. Norton, assignor to the Miller Company. (10 March 1931; filed 19 December 1929). Design no. 83,638; serial no. 33,836: Design for a lighting fixture. (Viewed 25 March 2018. AAA01526). Leroy C. Doane, assignor to the Miller Company. (28 April 1931; filed 8 August 1929). Letters patent no. 1,802,460; serial no. 384,356: Combined torchére and bridge lamp. (Viewed 25 March 2018. AAA01527). Leroy C. Doane and Guy P. Norton, assignors to the Miller Company. (2 June 1931; filed 19 June 1928). Letters patent no. 1,808,296; serial no. 286,585: Floor lamp. (Viewed 25 March 2018. AAA01523). Harold E. Ellis and Frank Theodore Williams, assignor to the Miller Company. (16 June 1931; filed 21 August 1929). Letters patent no. 1,809,892; serial no. 387,322: Brooder heater. (Viewed 1 May 2018; AAA02813). Leroy C. Doane and Herman H. Wolter, assignor to the Miller Company. (11 August 1931; filed 23 April 1927). Letters patent no. 1,818,119; serial no. 186,001: Lighting fixture wall bracket. (Viewed 1 May 2018; AAA02814). Leroy C. Doane, assignor to the Miller Company. (11 August 1931; filed 7 July 1928). Letters patent no. 1,818,120; serial no. 290,897: Lighting appliance. (Viewed 1 May 2018; AAA02815). Leroy C. Doane, assignor to the Miller Company. (3 November 1931; filed 3 December 1925). Letters patent no. 1,830,263; serial no. 72,896 (or 72,898): Inclosed lighting unit. (Viewed 1 May 2018; AAA02816). Frank Theodore Williams and Harold E. Ellis, assignor to the Miller Company. (8 December 1931). Original application filed 28 October 1929; serial no. 402,859; divided and this application filed 27 August 1930, letters patent no. 1,835,362; serial no. 478,088: Barometric liquid feeding device. (Viewed 1 May 2018; AAA02817). Louis L. Farrar, assignor to the Miller Company. (29 December 1931; filed 12 September 1931). Design no. 85,864; serial no. 41,077: Design for a shade or reflector. (Viewed 1 May 2018; AAA02818). Hagley Museum and Library, Wilmington, DE, call no. TRCAT (LIBRARY STACKS). Leroy Doane, assignor to Miller Company. (12 January 1932; filed 26 March 1929). Letters patent no. 1,840,768; serial no. 349,920: Swivel bracket for spotlights and the like. (Viewed 1 May 2018; AAA02819). Leroy C. Doane, assignor to the Miller Company. (12 January 1932; filed 21 August 1929). Letters patent no. 1,840,769; serial no. 387,383: Lamp. (Viewed 1 May 2018; AAA02820). Leroy C. Doane, assignor to the Miller Company. (19 January 1932; filed 20 January 1930). Letters patent no. 1,841,883; serial no. 422,006: Adjustable hickey. (Viewed 1 May 2018; AAA02821). Leroy C. Doane, assignor to the Miller Company. (5 April 1932; filed 21 August 1929). Letters patent no. 1,852,740; serial no. 387,385: Lamp. (Viewed 1 May 2018. AAA02822). Leroy C. Doane, assignor to the Miller Company. (5 April 1932; filed 26 March 1929). Letters patent no. 1,852,741; serial no. 349,919: Outdoor lighting unit. (Viewed 1 May 2018. AAA02823). Leroy C. Doane, assignor to the Miller Company. (31 May 1932; filed 23 March 1932). Design no. 87,049; serial no. 43,266: Design for a table lamp. (Viewed 1 May 2018. AAA02824). Leroy C. Doane, assignor to the Miller Company. (31 May 1932; filed 8 August 1929). Letters patent no. 1,860,530; serial no. 384,355: Electric heater. (Viewed 1 May 2018. AAA02825). Leroy C. Doane, assignor to the Miller Company. (7 June 1932; filed 8 August 1930). Letters patent no. 1,862,369; serial no. 473,812: Indirect lighting fixture. (Viewed 2 May 2018. AAA02825). Leroy C. Doane, assignor to the Miller Company. (28 June 1932; filed 29 August 1929). Letters patent no. 1,864,810; serial no. 389,161: Health lamp socket. (Viewed 2 May 2018. AAA02826). Leroy C. Doane, assignor to the Miller Company. (23 August 1932; filed 1 September 1928). Letters patent no. 1,873,308; serial no. 303,429: Inclosed lighting unit. (Viewed 2 May 2018. AAA02826). Leroy C. Doane, assignor to the Miller Company. (23 August 1932; filed 8 November 1929). Letters patent no. 1,873,309; serial no. 405,613: Lamp. (Viewed 2 May 2018. AAA02827). Frank Theodore Williams and Harold E. Ellis, assignor to the Miller Company. (23 August 1932; filed 28 October 1929). Letters patent no. 1,873,695; serial no. 402,859: Heater. (Viewed 2 May 2018. AAA02828). Offline - Connecticut Historical Society, Hartford, call no. Q644.3 M648m #169. Miller Company. (c. 1932). Duplexalite lighting equipment for commercial requirements [Catalog DP 172]. Meriden, CT; 39 pp. (Updated 28 June 2018. A00076; A03006; AAA03376-23). Columbia University, New York, call no. AT4100 M61 1932a. Offline - University of California Santa Barbara library, Special Coll., Romaine Trade Catalogs [Non-circulating]. Leroy C. Doane, assignor to the Miller Company. (9 May 1933; filed 11 May 1931). Letters patent no. 1,908,131; serial no. 536,387: Adjustable socket for lighting fixtures. (Viewed 2 May 2018. AAA02829). Leroy C. Doane, assignor to the Miller Company. (18 July 1933; filed 16 February 1932). Letters patent no. 1,918,455; serial no. 593,259: Indirect lighting fixture. (Viewed 2 May 2018. AAA02833). Shirley R. Naysmith, assignor to the Miller Company. (18 July 1933; filed 11 March 1930). Letters patent no. 1,918,484; serial no. 434,861: Lighting fixture. (Viewed 2 May 2018. AAA02834). Leroy C. Doane, assignor to the Miller Company. (3 October 1933; filed 23 October 1931). Letters patent no. 1,929,018; serial no. 570,535: Transformer assembly for floor lamps and the like. (Viewed 2 May 2018. AAA02835). Leroy C. Doane, assignor to the Miller Company. (17 October 1933; filed 23 September 1930). Letters patent no. 1,930,926; serial no. 483,814: Connection for electrical appliances. (Viewed 2 May 2018. AAA02830). Leroy C. Doane, assignor to the Miller Company. (17 October 1933; filed 17 March 1932). Letters patent no. 1,930,927; serial no. 599,447: Electrical fitting. (Viewed 2 May 2018. AAA02831). Leroy C. Doane, assignor to the Miller Company. (14 November 1933; filed 1 September 1931). Letters patent no. 1,935,045; serial no. 560,551: Collapsible reflector. (Viewed 2 May 2018. AAA02832). Southern Public Utilities Co., presumably Salisbury, NC. (19 January 1934). Advertisement: "... How many of these labor savers do you have? ... Miller lamps... " [with no related product illustrations]. Carolina Watchman (Salisbury, North Carolina), p. 5, col. 5-7. (Viewed 11 October 2018. B00940-41). Southern Public Utilities Co., presumably Hendersonville, NC. (24 February 1934). Advertisement: "... How many of these labor savers do you have? ... Miller lamps... " [with no product illustrations]. The Times-News (Hendersonville, North Carolina), p. 6, col. 5-8. (Viewed 11 October 2018. B00939). Southern Public Utilities Co., presumably Hendersonville, NC. (27 September 1934). Advertisement: "... The Miller Indirect Lamps... " [with graphical illustrations and radio program mention]. The Times-News (Hendersonville, North Carolina), p. 6, col. 5-8. (Viewed 12 October 2018. B00958-59). Southern Public Utilities Co., presumably Salisbury, NC. (5 October 1934). Advertisement: "... The Miller Indirect Lamps... " [with graphical illustrations and radio program mention]. Carolina Watchman (Salisbury, North Carolina), p. 2, cols. 4-7. (Viewed 12 October 2018. B00956-57). Southern Public Utilities Co., presumably Hendersonville, NC. (6 October 1934). Advertisement: "... The Miller Indirect Lamps... " [with graphical illustrations and radio program mention]. The Times-News (Hendersonville, North Carolina), p. 3, cols. 7-8. (Viewed 12 October 2018. B00960-61). Southern Public Utilities Co., presumably Hendersonville, NC. (20 October 1934). Advertisement: "... The Miller Indirect Lamps... " [with no specific illustration, and mention of radio program]. The Times-News (Hendersonville, North Carolina), p. 6, cols. 5-8. (Viewed 12 October 2018. B00962-63). Leroy C. Doane, assignor to the Miller Company. (6 February 1934; filed 2 May 1930). Letters patent no. 1,945,738; serial no. 449,154: Dust cover for reflectors. (Viewed 2 May 2018. AAA02843). Leroy C. Doane, assignor to the Miller Company. (6 February 1934; filed 23 October 1931). Letters patent no. 1,945,739; serial no. 570,533: Adjustable bracket for lamps. (Viewed 2 May 2018. AAA02837). Shirley R. Naysmith, assignor to the Miller Company. (3 April 1934; filed 23 October 1931). Letters patent no. 1,953,816; serial no. 570,525: Inclosed indirect lighting fixture. (Viewed 2 May 2018. AAA02838). Leroy C. Doane, assignor to the Miller Company. (24 April 1934; filed 10 February 1932). Letters patent no. 1,956,375; serial no. 591,943: Indirect lighting fixture. (Viewed 2 May 2018. AAA02836). Leroy C. Doane, assignor to the Miller Company. (22 May 1934; filed 17 March 1932). Letters patent no. 1,959,819; serial no. 599,448: Lighting fixture. (Viewed 2 May 2018. AAA02845). Leroy C. Doane, assignor to the Miller Company. (17 July 1934; filed 30 July 1932). Letters patent no. 1,966,583; serial no. 626,500: Lighting fixture. (Viewed 2 May 2018. AAA02846). Leroy C. Doane, assignor to the Miller Company. (18 September 1934; filed 7 November 1931). Letters patent no. 1,974,063; serial no. 573,537: Lamp. (Viewed 2 May 2018. AAA02847). Leroy C. Doane and Herman H. Wolter, assignors to the Miller Company. (2 October 1934). Letters patent no. 1,975,197: original application 23 April 1927; serial no. 186,001. Divided and this application 11 July 1931, serial no. 550,092: Shade for lighting fixtures. (Viewed 2 May 2018. AAA02839). Leroy C. Doane, assignor to the Miller Company. (9 October 1934; filed 23 September 1930). Letters patent no. 1,975,833; serial no. 483,815: Lamp and fixture parts. (Viewed 2 May 2018. AAA02840). Leroy C. Doane, assignor to the Miller Company. (9 October 1934; filed 10 April 1931). Letters patent no. 1,976,545; serial no. 529,003: Lighting fixture for ultra-violet and incandescent lamps. (Viewed 2 May 2018. AAA02844). Leroy C. Doane, assignor to the Miller Company. (16 October 1934; filed 31 December 1929). Letters patent no. 1,977,378; serial no. 417,692: Lighting appliance. (Viewed 2 May 2018. AAA02841). Leroy C. Doane, assignor to the Miller Company. (23 October 1934; filed 27 May 1932). Letters patent no. 1,978,251; serial no. 613,909: Lighting appliance. (Viewed 2 May 2018. AAA02842). Leroy C. Doane, assignor to the Miller Company. (27 November 1934; filed 7 April 1931). Letters patent no. 1,982,203; serial no. 528,300: Convertible floor lamp. (Viewed 2 May 2018. AAA02848). Leroy C. Doane, assignor to the Miller Company. (27 November 1934; filed 9 March 1932). Letters patent no. 1,982,204; serial no. 597,673: Lighting fixture. (Viewed 2 May 2018. AAA02849). Columbia University, New York, call no. AT4100 M61 1934. Miller Company. (1935). [Miller Mer-Tung Equipment Price List]. Number of pages unknown. Meriden, CT.
Southern Public Utilities Company, presumably Hendersonville, NC. (18 January 1935). Advertisement: "The Modern Woman... Miller Lamps ..." [with no illustrations of lamps]. The Times-News (Second Annual Motion Picture Edition) (Hendersonville, North Carolina), p. 9, cols. 2-5. (Viewed 24 September 2018. B00436-37). Southern Public Utilities Company, presumably Hendersonville, NC. (25 April 1935). Advertisement: "... Electricity does her work! ... Miller Lamps ..." [with no illustrations of lamps]. The Times-News (Hendersonville, North Carolina), p. 3, cols. 6-8. (Viewed 24 September 2018. B00438-39). Duke Power Company (formerly Southern Public Utilities Co.), presumably Hendersonville, NC. (19 October 1935). Advertisement: "The new Miller I. E. S. sight saving lamps, they will help you see better..." [with illustrations]. The Times-News (Hendersonville, North Carolina), p. 3, cols. 7-8. (Viewed 24 September 2018. B00440-41). Leroy C. Doane, assignor to the Miller Company. (8 January 1935; filed 28 July 1932). Letters patent no. 1,987,471; serial no. 625,239: Lighting unit. (Viewed 2 May 2018. AAA02850). Leroy C. Doane, assignor to the Miller Company. (19 March 1935; filed 23 September 1930). Letters patent no. 1,994,886; serial no. 483,816: Telescopic lamp part. (Viewed 2 May 2018. AAA02851). Leroy C. Doane, assignor to the Miller Company. (23 April 1935; filed 15 January 1931). Letters patent no. 1,998,573; serial no. 508,837: Indirect lighting fixture employing ultraviolet and incandescent lamps. (Viewed 2 May 2018. AAA02852). Leroy C. Doane, assignor to the Miller Company. (2 July 1935; filed 10 December 1932). Letters patent no. 2,007,040; serial no. 646,645: Lighting fixture. (Viewed 2 May 2018. AAA02853). Leroy C. Doane, assignor to the Miller Company. (1 October 1935; filed 20 January 1930). Letters patent no. 2,015,715; serial no. 422,005: Disconnecting holder. (Viewed 2 May 2018. AAA02854). Leroy C. Doane, assignor to the Miller Company. (22 October 1935; filed 12 May 1932). Letters patent no. 2,017,953; serial no. 610,801" Lighting fixture. (Viewed 2 May 2018. AAA02855). Possibly Miller Company. (c. 1935-55). Original drawings of lighting in sketchbook. 26 pp. (Viewed 18 June 2017. AAA00609). Miller Company. (undated). [Miller Mer-Tung Equipment (Catalog No. 870)]. Meriden, CT.
Miller Company. (1937). More and Better Light for Industry with the New Ivanhoe Alzak Aluminum Reflectors, with reflective silver ink embellishments and backgrounds. 19 pp. Duke Power Co., presumably Hendersonville, NC. (26 January 1937). Advertisement: "... Miller lamps..." [with no illustrations of lamps]. The Times-News (Hendersonville, North Carolina), p. 4, cols. 6-8. (Viewed 24 September 2018. B00434-35). Leroy C. Doane, assignor to the Miller Company. (5 January 1937; filed 16 February 1932). Letters patent no. 2,066,770; serial no. 593,258: Electrical connecter. (Viewed 3 May 2018. AAA02857). Leroy C. Doane, assignor to the Miller Company. (5 January 1937; filed 4 January 1935). Letters patent no. 2,066,771; serial no. 322: Indirect lighting fixture. (Viewed 3 May 2018. AAA02858). Leroy C. Doane, assignor to the Miller Company. (12 January 1937; filed 6 November 1936). Design no. 102,678; serial no. 65,728: Design for a lighting fixture globe. (Viewed 3 May 2018. AAA02859). Leroy C. Doane, assignor to the Miller Company. (7 September 1937; filed 7 December 1935). Letters patent no. 2,092,573; serial no. 53,341: Lighting appliance. (Viewed 3 May 2018. AAA02860). Leroy C. Doane, assignor to the Miller Company. (21 December 1937; filed 25 March 1936). Letters patent no. 2,102,944; serial no. 70,816: Lighting equipment for passenger vehicles. (Viewed 3 May 2018. AAA02861). G. Fox & Co., Hartford, CT. (25 April 1938). Advertisement: "... G. Fox & Co. features ’Connecticut Made’ products all week... Floor Lamps of Quality... Made in Meriden" [company or companies unspecified, probably Bradley & Hubbard or Miller Company]. Hartford Courant, p. 9. (Viewed 25 October 2018. C00318-19). Leroy C. Doane, assignor to the Miller Company. (1 February 1938; filed 5 April 1935). Letters patent no. 2,107,027; serial no. 14,756: Indirect lighting unit. (Viewed 3 May 2018. AAA02864). Leroy C. Doane, assignor to the Miller Company. (1 February 1938; filed 6 February 1936). Letters patent no. 2,107,028; serial no. 62,601: Direct lighting fixture. (Viewed 3 May 2018. AAA02865). Leroy C. Doane, assignor to the Miller Company. (1 February 1938; filed 25 September 1936). Letters patent no. 2,107,029; serial no. 102,525: Lighting fixture. (Viewed 3 May 2018. AAA02866). Leroy C. Doane, assignor to the Miller Company. (2 August 1938; filed 2 January 1935). Letters patent no. 2,125,335; serial no. 57,227: Indirect lighting fixture. (Viewed 3 May 2018. AAA02867). Leroy C. Doane, assignor to the Miller Company. (15 November 1938; filed 29 May 1937). Letters patent no. 2,136,912; serial no. 145,427: Hinge mechanism for lighting fixtures. (Viewed 3 May 2018. AAA02868). Leroy C. Doane, assignor to the Miller Company. (6 December 1938; filed 25 March 1936). Letters patent no. 2,139,005; serial no. 176,050: Lighting fixture screen. (Viewed 3 May 2018. AAA02869). Online - Courtesy San Francisco Public Library, California. "Some excellent data on lighting, especially on high tension systems, is contained in a booklet by the Miller Company. The booklet deals with the use of Fluorescent fixtures"
(18 September 1939). Connecticut industry marches on [with mention of Miller Company as exhibitor in Association of Iron and Steel Engineers exhibition, Pittsburgh (26 - 29 September 1939)]. Hartford Courant, p. 3. (Viewed 3 January 2019. H00473). Charles D. Poey, assignor to the Miller Company. (24 January 1939; filed 31 August 1937). Letters patent no. 2,144,931; serial no. 161,741: Indirect lighting fixture. (Viewed 3 May 2018. AAA02870). Leroy C. Doane, assignor to the Miller Company. (14 February 1939; filed 1 May 1937). Letters patent no. 2,147,284; serial no. 140,137: Hickey. (Viewed 3 May 2018. AAA02871). Leroy C. Doane, assignor to the Miller Company. (2 May 1939; filed 3 May 1937). Letters patent no. 2,156,621; serial no. 140,419: Vehicle lighting fixture. (Viewed 3 May 2018. AAA02872). Leroy C. Doane, assignor to the Miller Company. (16 May 1939; filed 8 July 1936). Letters patent no. 2,158,653; serial no. 89,536: Passenger vehicle lighting. (Viewed 3 May 2018. AAA02873). Leroy C. Doane, assignor to the Miller Company. (13 June 1939; filed 29 May 1936). Letters patent no. 2,162,330; serial no. 82,497: Direct lighting luminaire. (Viewed 3 May 2018. AAA02874). Leroy C. Doane, assignor to the Miller Company. (22 August 1939; filed 29 May 1937). Letters patent no. 2,170,189; serial no. 145,428: Lighting fixture. (Viewed 3 May 2018. AAA02875). Leroy C. Doane, assignor to the Miller Company. (26 September 1939; filed 25 March 1936). Letters patent no. 2,173,899; serial no. 70,817: Lighting equipment for passenger vehicles. (Viewed 3 May 2018. AAA02876). Gillson W. Beals, assignor to the Miller Company. (28 November 1939; filed 5 August 1939). Design no. 117,827; serial no. 86,475: Design for a desk lamp. (Viewed 3 May 2018. AAA02877). Online - Courtesy Tulane University, Southeastern Architectural Archive, New Orleans, LA. Miller Company. (c. 1939-40). Binder no. 6794. [Viewed 28 June 2018. A03006; AAA03376-31(-44)]. > Miller Company. (1939). Ivanhoe industrial lighting, Mazda reflectors [section 1A]. Approx. 60 pp. > Miller Company. (1939). Ivanhoe industrial lighting, Mercury reflectors [section 1B]. Approx. 24 pp. > Miller Company. (1941). Ivanhoe industrial lighting, fluorescent reflectors [section 1C]. Approx. 40 pp. > Miller Company. (1939). Ivanhoe fixtures, commercial lighting [section 2A]. Approx. 59 pp. > Miller Company. (1939). Duplexlite fixtures, commercial lighting [section 2B]. Approx. 52 pp. > Miller Company. (1939). Silvered bowl fixtures, commercial lighting [section 2C]. Approx. 20 pp. > Miller Company. (1939). Mer-Tung fixtures, commercial lighting [section 2D]. Approx. 29 pp. > Miller Company. (1939). Ivanhoe commercial lighting, hangers and glassware [section 2E]. Approx. 9 pp. > Miller Company. (1939). Window reflectors, commercial lighting [section 2F]. Approx. 4 pp. > Miller Company. (1940). Fluorescent fixtures, commercial lighting [section 2G]. Approx. 8 pp. > Miller Company. (1939). Adaptors, residential lighting [section 3B]. Approx. 13 pp. > Miller Company. (1940). Lamps and shades, residential lighting [section 3C]. Approx. 4 pp. > Additional loose binder pages below (see 1941, 1942, 1950, 1951 loose binder pages below). Click the following link to see the parallel webpage - Miller Company product designs in collections and historical lighting installations. G. Fox & Co., Hartford, CT. (February 1940). Advertisement: "... Feb. 10 to 17, Fox’s Fourth Annual Connecticut-Made Week... expected to have displays or exhibits... Miller Company ... " Hartford Courant. (Viewed 24 October 2018. C00314; C00317). (28 October 1940). Connecticut industry marches on [with two-paragraph section about a "New oil burner" for small homes by the Miller Company]. Hartford Courant, p. 16. (Viewed 19 October 2018. D00316). Leroy C. Doane, assignor to the Miller Company. (2 January 1940; filed 1 May 1937). Letters patent no. 2,185,703; serial no. 140,136: Snap hook. (Viewed 3 May 2018. AAA02880). Donald H. Lapointe, assignor to the Miller Company. (9 January 1940; filed 12 February 1938). Letters patent no. 2,186,726; serial no. 190,145: Liquid fuel supply mechanism for oil stoves. (Viewed 3 May 2018. AAA02881). Leroy C. Doane, assignor to the Miller Company. (21 May 1940; filed 31 August 1937). Letters patent no. 2,201,856; serial no. 161,769: Vehicle lighting equipment. (Viewed 3 May 2018. AAA02882). Richard M. Runge and Ernest B. Pascucci, assignors to the Miller Company. (28 May 1940; filed 31 October 1938). Letters patent no. 2,202,718; serial no. 237,826: Oil burner. (Viewed 3 May 2018. AAA02878). James Gould, Jr., assignor to the Miller Company. (18 June 1940; filed 6 September 1939). Letters patent no. 2,204,986; serial no. 293,530: Portable lamp. (Viewed 3 May 2018. AAA02879). Online - Courtesy Canadian Centre for Architecture, Montréal, Québec. / APT Building Technology Heritage Library. Offline - Connecticut Historical Society, Hartford, call no. 644.3 M648 #938. Miller Company. (1941). Loose product flyers associated with c. 1939-40 binder listed above. [Viewed 28 June 2018. A03006; AAA03376-47(-60)]. > Miller Company. (1941). Ivanhoe elliptical angle reflectors [section 1A]. Approx. 2 pp. > Miller Company. (1941). Ivanhoe industrial lighting equipment [section 1A]. Approx. 4 pp. > Miller Company. (1941). Ivanhoe steel porcelain enameled high mounting units for the 400 watt Mercury lamp [section 1B]. Approx. 1 page. > Miller Company. (1941). Ivanhoe industrial lighting equipment [section 1B]. Approx. 1 page. > Miller Company. (1941). Ivanhoe industrial fluorescent lighting equipment [section 1C]. Approx. 1 page. > Miller Company. (1941). Ivanhoe commercial lighting fixtures [section 2A]. Approx. 1 page. > Miller Company. (1941). Duplexalite commercial lighting fixtures [section 2B]. Approx. 1 page. > Miller Company. (1941). 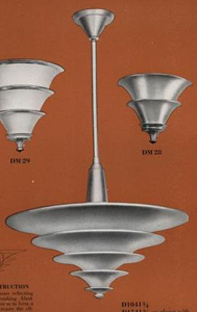 Miller lighting fixtures for use with silvered bowl Mazda lamps [section 2C]. Approx. 1 page. > Miller Company. (1941). Miller Mer-tung lighting fixtures [section 2D]. Approx. 1 page. > Miller Company. (1941). Ivanhoe hangers and glassware [section 2E]. Approx. 1 page. > Miller Company. (1941). Ivanhoe window lighting reflectors and equipment [section 2F]. Approx. 1 page. > Miller Company. (1941). Miller commercial fluorescent lighting equipment [section 2G]. Approx. 1 page. > Miller Company. (1941). Miller lighting adaptors [section 3B]. Approx. 1 page. > Miller Company. (1941). Miller fluorescent desk lamps [section 3C]. Approx. 1 page. Miller Company. (1941). The Miller Company’s 1941 calendar of cooperation. Approx. 8 pp. (Viewed 28 June 2018. A03006; AAA03376-30). James Gould, Jr., assignor to the Miller Company. (4 March 1941; filed 6 September 1939). Letters patent no. 2,233,780; serial no. 293,529: Indirect lighting lamp and shade therefor. (Viewed 3 May 2018. AAA02883). Leroy C. Doane, assignor to the Miller Company. (8 April 1941; filed 3 May 1939). Letters patent no. 2,237,657; serial no. 271,434: Lighting fixture. (Viewed 3 May 2018. AAA02884). Donald H. Lapointe, assignor to the Miller Company. (8 April 1941; filed 1 November 1937). Letters patent no. 2,237,674; serial no. 172,122: Liquid fuel stove. (Viewed 3 May 2018. AAA02885). Ralph W. De Lancey, assignor to the Miller Company. (12 August 1941; filed 5 October 1940). Letters patent no. 2,252,459; serial no. 359,872: Liquid control valve. (Viewed 3 May 2018. AAA02886). Ralph W. De Lancey, assignor to the Miller Company. (4 November 1941; filed 17 August 1939). Letters patent no. 2,261,234; serial no. 290,694: Fuel feed control. (Viewed 3 May 2018. AAA02887). Gillson W. Beals, assignor to the Miller Company. (11 November 1941; filed 18 October 1939). Letters patent no. 2,262,157; serial no. 299,941: Enclosed direct lighting luminaire. (Viewed 3 May 2018. AAA02888). Shirley R. Naysmith, assignor to the Miller Company. (2 December 1941; filed 4 November 1939). Letters patent no. 2,264,951; serial no. 302,819: Lighting fixture. (Viewed 3 May 2018. AAA02889). Gillson W. Beals, assignor to the Miller Company. (2 December 1941; filed 23 September 1939). Letters patent no. 2,265,021; serial no. 296,193: Direct lighting luminaire. (Viewed 3 May 2018. AAA02890). Miller Company. (1942). Loose product flyers associated with c. 1939-40 binder listed above. [Viewed 28 June 2018. A03006; AAA03376-61(-62)]. > Miller Company. (1942). Advance data sheet [section 1C]. Approx. 11 pp. > Miller Company. (1942). Miller standard hangers [section 2E]. Approx. 2 pp. James Gould, Jr., assignor to the Miller Company. (3 February 1942; filed 6 September 1939). Letters patent no. 2,272,085; serial no. 293,531: Portable lamp. (Viewed 3 May 2018. AAA02892). Shirley R. Naysmith, assignor to the Miller Company. (10 March 1942; filed 18 April 1941). Design no. 131,532; serial no. 100,488: Design for a lighting fixture. (Viewed 3 May 2018. AAA02893). Ralph W. De Lancey, assignor to Miller Company. (12 May 1942; filed 23 December 1939). Letters patent no. 2,282,989; serial no. 310,745: Oil burner. (Viewed 3 May 2018. AAA02894). Ralph W. De Lancey, assignor to the Miller Company. (16 June 1942; filed 15 February 1940). Letters patent no. 2,286,266; serial no. 318,994: Thermostat. (Viewed 3 May 2018. AAA02895). Richard M. Runge, assignor to the Miller Company. (23 June 1942; filed 15 January 1941). Letters patent no. 2,287,276; serial no. 374,449: Locking devices for tubular lamps. (Viewed 4 May 2018. AAA02896). Ralph W. De Lancey, assignor to the Miller Company. (21 July 1942; filed 18 October 1939). Letters patent no. 2,290,544; serial no. 299,943: Liquid fuel burner. (Viewed 4 May 2018. AAA02897). Shirley R. Naysmith, assignor to the Miller Company. (28 July 1942; filed 5 November 1940). Letters patent no. 2,291,488; serial no. 364,360: Direct lighting luminaire. (Viewed 4 May 2018. AAA02898). Shirley R. Naysmith, assignor to the Miller Company. (28 July 1942; filed 22 May 1940). Letters patent no. 2,291,489; serial no. 336,568: Recessed lighting apparatus. (Viewed 4 May 2018. AAA02899). Shirley R. Naysmith, assignor to the Miller Company. (28 July 1942; filed 31 January 1941). Letters patent no. 2,291,490; serial no. 376,779: Combined wiring conduit and fluorescent lamp fixture. (Viewed 4 May 2018. AAA02900). Shirley R. Naysmith, assignor to the Miller Company. (28 July 1942; filed 31 January 1941). Letters patent no. 2,291,491; serial no. 376,781: Combined wiring cinduit and fluorescent lamp fixture. (Viewed 4 May 2018. AAA02903). Shirley R. Naysmith, assignor to the Miller Company. (28 July 1942; filed 23 May 1941). Letters patent no. 2,291,492; serial no. 394,814: Support. (Viewed 4 May 2018. AAA02904). Shirley R. Naysmith, assignor to the Miller Company. (28 July 1942; filed 29 May 1941). Letters patent no. 2,291,493; serial no. 395,757: Lighting fixture. (Viewed 4 May 2018. AAA02905). Harold F. Lorenz, assignor to the Miller Company. (28 July 1942; filed 5 November 1940). Letters patent no. 2,291,494; serial no. 2,291,494: System of lighting and lighting unit for use therein. (Viewed 4 May 2018. AAA02908). Gillson W. Beals, assignor to the Miller Company. (28 July 1942; filed 21 February 1941). Letters patent no. 2,291,495; serial no. 379,917: Lighting fixture. (Viewed 4 May 2018. AAA02909). James Gould, Jr., assignor to the Miller Company. (29 September 1942; filed 22 March 1941). Letters patent no. 2,297,144; serial no. 384,654: Portable lamp. (Viewed 4 May 2018. AAA02910). Ralph W. De Lancey, assignor to the Miller Company. (17 November 1942; filed 31 January 1940). Letters patent no. 2,302,108; serial no. 316,566: Temperature responsive device. (Viewed 4 May 2018. AAA02911). Ralph W. De Lancey, assignor to the Miller Company. (8 December 1942; filed 21 February 1941). Letters patent no. 2,304,444; serial no. 379,929: Liquid level control apparatus. (Viewed 4 May 2018. AAA02912). James Donnelly, assignor to the Miller Company. (2 March 1943; filed 24, February 1941). Letters patent no. 2,312,393; serial no. 380,138: Lighting fixture closure. (Viewed 4 May 2018. AAA02901). Shirley R. Naysmith, assignor to the Miller Company. (1 June 1943; filed 18 April 1941). Letters patent no. 2,320,829; serial no.389,144: Lighting fixture. (Viewed 4 May 2018. AAA02902). Shirley R. Naysmith, assignor to the Miller Company. (8 June 1943; filed 11 October 1941). Letters patent no. 2,321,099; serial no. 414,586: Lighting equipment. (Viewed 3 May 2018. AAA02891). Ralph W. De Lancey, assignor to the Miller Company. (4 January 1944; filed 2 August 1940). Letters patent no. 2,338,319; serial no. 349,844: Fuel feed control. (Viewed 5 May 2018. AAA02914). Ralph W. De Lancey, assignor to the Miller Company. (14 March 1944; filed 27 January 1940). Letters patent no. 2,344,291; serial no. 316,040" Liquid food stove. (Viewed 5 May 2018. AAA02915). Richard M. Runge, assignor to the Miller Company. (14 March 1944; filed 26 September 1940). Letters patent no. 2,344,327; serial no. 358,412: Closure. (Viewed 5 May 2018. AAA02916). Gillson W. Beals, assignor to the Miller Company. (25 July 1944; filed 16 March 1943). Letters patent no. 2,354,242; serial no. 479,331: Lighting fixture shade and holder. (Viewed 5 May 2018. AAA02917). Ralph W. De Lancey, assignor to the Miller Company. (26 September 1944; filed 15 April 1942). Letters patent no. 2,359,024; serial no. 439,017: Fuel control valve. (Viewed 5 May 2018. AAA02918). Shirley R. Naysmith, assignor to the Miller Company. (7 November 1944; filed 25 July 1942). Letters patent no. 2,362,148; serial no. 452,352: Enclosed and protected electrical apparatus. (Viewed 5 May 2018. AAA02919). Click to see c. 1945+ Ceilings Unlimited interior design lighting installations on our parallel Miller Company product designs in collections and historical lighting installations page. Wadsworth Atheneum archive, Hartford, Painting toward architecture file. Ralph W. De Lancey, assignor to the Miller Company. (9 January 1945; filed 10 October 1942). Letters patent no. 2,366,839; serial no. 461,509: Pot type burner. (Viewed 6 May 2018. AAA02920). James Donnelly, assignor to the Miller Company. (6 February 1945; filed 2 December 1942). Letters patent no. 2,368,810; serial no. 467,576: Lighting fixture. (Viewed 6 May 2018. AAA02921). Ralph W. De Lancey, assignor to the Miller Company. (17 April 1945; filed 1 January 1943). Letters patent no. 2,373,814; serial no. 470,961: Liquid fuel burner. (Viewed 6 May 2018. AAA02922). Ralph W. De Lancey, assignor to the Miller Company. (15 May 1945; filed 25 June 1942). Letters patent no. 2,375,900; serial no. 448,385: Fuel burner control system. (Viewed 6 May 2018. AAA02923). Shirley R. Naysmith, assignor to the Miller Company. (22 May 1945; filed 6 May 1943). Letters patent no. 2,376,715; serial no. 485,793: Ceiling. (Viewed 6 May 2018. AAA02924). Ralph W. De Lancey, assignor to the Miller Company. (13 November 1945; filed 26 April 1944). Letters patent no. 2,388,907; filed 26 April 1944: Vaporizing burner. (Viewed 6 May 2018. AAA02925). Ralph W. De Lancey, assignor to the Miller Company. (13 November 1945; filed 26 April 1944). Letters patent no. 2,388,908; serial no. 532,704: Vaporizing burner. (Viewed 6 May 2018. AAA02926). Ralph W. De Lancey, assignor to the Miller Company. (4 December 1945; filed 1 January 1943). Letters patent no. 2,390,059; serial no. 470,960: Liquid fuel burner. (Viewed 6 May 2018. AAA02927). Shirley R. Naysmith, assignor to the Miller Company. (11 December 1945; filed 4 June 1943). Letters patent no. 2,390,807; serial no. 489,603: Fluorescent lighting fixture. (Viewed 6 May 2018. AAA02928). “Miss Louisa Kuhns, a Miller worker has been rated America’s No. 1 war worker in an article which went out over the Associated Press wire to all newspapers.” (excerpt from above). Shirley R. Naysmith, assignor to the Miller Company. (19 February 1946; filed 16 March 1943). Letters patent no. 2,395,008; serial no. 479,327: Fluorescent lighting equipment. (Viewed 4 May 2018. AAA02906). John Carulli, assignor to the Miller Company. (21 May 1946; filed 29 September 1945). Design no. 144,758; serial no. 122,408: Design for an end plate for fluorescent lighting fixtures. (Viewed 4 May 2018. AAA02907). Online - Courtesy University of Florida library, Gainesville. Yale University library, New Haven, CT.
Ralph W. De Lancey, assignor to the Miller Company. (8 July 1947; filed 6 February 1941). Letters patents no. 2,423,808; serial no. 377,613: Method of and apparatus for burning liquid fuel. (Viewed 6 May 2018. AAA02931). Ralph W. De Lancey, assignor to the Miller Company. (8 July 1947; filed 21 March 1942). Letters patents no. 2,423,809; serial no. 435,690: ignition means for liquid fuel burners. (Viewed 6 May 2018. AAA02932). Gillson W. Beals, assignor to the Miller Company. (29 July 1947; filed 2 April 1943). Letters patent no. 2,424,874; serial no. 481,539: Lamp retainer for fluorescent lamps and the like. (Viewed 6 May 2018. AAA02933). Ralph W. De Lancey, assignor to the Miller Company. (14 October 1947; filed 13 November 1943). Letters patent no. 2,428,867; serial no. 510,184: Fuel control for furnaces. (Viewed 4 February 2019. F00539). Ralph W. De Lancey, assignor to the Miller Company. (9 December 1947; filed 13 November 1943). Letters patent no. 2,432,143; serial no. 510,182: Liquid fuel feeding and burning apparatus. (Viewed 4 February 2019. F00540). Offline - Wadsworth Atheneum archive, Painting toward architecture file. Offline - photo - See: Alice B. Louchheim. (December 1947). Abstraction on the assembly line. ARTnews magazine. See worldcat.org for locations. Online - Courtesy San Francisco Public Library, CA. "A revised edition of the book published in 1945-46 by the Miller Company which created considerable interest among architects, lighting engineers, electrical contractors, and commercial executives. It illustrates and describes in detail Miller Fluorescent Troffer Lighting Systems, and gives complete engineering and installation details, and illumination performance. "Shows examples of how architects and engineers have made use of the opportunity afforded them to create attractive ceiling designs by adopting the Miller method of combining lighting equipment." — from Architect and Engineer mentioned above. Serge Ivan Chermayeff Architectural Records and Papers, 1909-1980. Columbia University, Avery Architectural & Fine Arts Library, Box 11, Series: Project Records - Subseries: Drawings - Subseries: Files. Ralph W. De Lancey, assignor to the Miller Company. (13 April 1948; filed 22 June 1945). Letters patent no. 2,439,455; serial no. 601,014: Thermostatic device. (Viewed 6 May 2018. AAA02929). Richard M. Runge, assignor to the Miller Company. (20 April 1948; filed 23 April 1946). Letters patent no. 2,440,186; serial no. 664,317: Lighting fixture hinge. (Viewed 6 May 2018. AAA02930). Shirley R. Naysmith, assignor to the Miller Company. (3 August 1948; filed 28 March 1945). Letters patent no. 2,446,240; serial no. 585,298: Wiring device. (Viewed 4 February 2019. F00542). Ralph W. De Lancey, assignor to the Miller Company. (24 August 1948; filed 13 November 1943). Letters patent no. 2,447,902; serial no. 510,183: Fuel control for hot-air heaters. (Viewed 4 February 2019. F00543). Gillson W. Beals, assignor to the Miller Company. (30 November 1948; filed 25 July 1945). Letters patent no. 2,455,107; serial no. 607,009: Lighting fixture cover. (Viewed 4 February 2019. F00541). See (1948). Catalogue of Copyright Entries. Third Series: 1948, p. 523. On Google Books. Online - Courtesy San Francisco Public Library. Miller Company. (1950). Loose product flyers associated with c. 1939-40 binder listed above. [Viewed 28 June 2018. A03006; AAA03376-63(-66)]. > Miller Company. (1950). Aluminum high bay unit [section 1A]. Approx. 1 page. > Miller Company. (1950). Porcelain enameled medium high bay unit [section 1A]. Approx. 1 page. > Miller Company. (1950). Aluminum medium high bay unit [section 1A]. Approx. 1 page. > Miller Company. (1950). Miller inspection luminaire for two and three 40 watt [section 1C]. Approx. 1 page. Online - Guggenheim Museum Library, New York. Ralph W. De Lancey, assignor to the Miller Company. (21 February 1950; filed 13 November 1943). Letters patent no. 2,498,362; serial no. 510,181: Convection and forced draft air flow and combustion air heating furnace. (Viewed 4 February 2019. F00545). Richard M. Runge, assignor to the Miller Company. (15 August 1950; filed 11 March 1947). Letters patent no. 2,518,724; serial no. 733,921: Inbuilt lighting equipment. (Viewed 4 February 2019. F00544). Shirley R. Naysmith, assignor to the Miller Company. (21 November 1950; filed 14 January 1947). Patent no. 2,531,232: serial no. 721,970: Fluorescent lighting fixture. (Viewed 14 March 2018. AAA01129). Miller Company. (1951). Loose product flyers associated with c. 1939-40 binder listed above. [Viewed 28 June 2018. A03006; AAA03376-67(-73)]. > Miller Company. (1951). Miller 50 foot Candler Jr. fluorescent luminaires for industrial lighting [section 1C]. Approx. 6 pp. > Miller Company. (1951). Miller Camden fluorescent luminaire [section 2G]. Approx. 3 pp. > Miller Company. (1951). Miller marketer fluorescent luminaire for store lighting [section 2G]. Approx. 3 pp. > Miller Company. (1951). Miller circleville luminaires for use in stores, offices, drafting rooms, libraries, etc. for use with silver bowl lamps and semi-silver bowl lamps [section 2B]. Approx. 3 pp. > Miller Company. (1951). List prices, schedule 1A. Approx. 3 pp. > Miller Company. (1951). List prices, schedule 1B. Approx. 1 page. > Miller Company. (1951). Miller standard hangers [Schedule 2E, Section 2E]. Approx. 2 pp. Online - Courtesy Institute of Electrical and Electronics Engineers, Piscataway, NJ, USA. Richard M. Runge and Julio A. Pascucci, assignors to the Miller Company. (6 October 1953; filed 13 November 1947). Letters patent no. 2,654,830; serial no. 785,648: Direct lighting equipment. (Viewed 4 February 2019. F00528). Ralph W. De Lancey, assignor to the Miller Company. (22 December 1953; filed 14 April 1951). Letters patent no. 2,663,365; serial no. 221,041: Firing head assembly for fuel burners. (Viewed 4 February 2019. F00529). Richard M. Runge, assignor to the Miller Company. (11 September 1956; filed 16 February 1953). Letters patent no. 2,762,598; serial no. 336,987: Lighting fixture hangers. (Viewed 3 February 2019. F00521). Julio A. Pascucci, assignor to the Miller Company. (22 September 1959; filed 14 January 1957). Letters patent no. 2,905,809; serial no. 634,104: Structure for mounting sockets and other devices in lighting fixtures. (Viewed 3 February 2019. F00522). Douglas Arnold, assignor to the Miller Company. (1 March 1960; filed 24 September 1958). Design no. 187,337; serial no. 52,744: Lighting fixture. (Viewed 3 February 2019. F00525). Julio A. Pascucci, assignor to the Miller Company. (7 June 1960; filed 29 October 1956). Letters patent no. 2,939,669; serial no. 618,795: Hanger assembly for lighting fixtures. (Viewed 3 February 2019. F00524). Ernest Pascucci, assignor to the Miller Company. (26 July 1960; filed 6 May 1957). Letters patent no. 2,946,881; serial no. 657,142: Leveling device for lighting fixtures. (Viewed 3 February 2019. F00523). Julio A. Pascucci and Ernest B. Pascucci, assignors to the Miller Company. (27 September 1960; filed 29 July 1957). Letters patent no. 2,954,201; serial no. 674,867: Adjustable mounting device. (Viewed 3 February 2019. F00526). Julio A. Pascucci, assignor to the Miller Company. (27 December 1960; filed 6 May 1957). Letters patent no. 2,966,325; serial no. 657,353: Leveling and mounting device for lighting fixtures. (Viewed 4 February 2019. F00527). Henry C. Schiffer, assignor to the Miller Company. (21 February 1961; filed 10 September 1956). Letters patent no. 2,972,675; serial no. 608,795: Fluorescent lighting fixture and socket assembly therefor. (Viewed 3 February 2019. F00515). Henry C. Schiffer, assignor to the Miller Company. (30 January 1962; filed 3 June 1959). Letters patent no. 3,019,332; serial no. 817,780: Lighting fixture and connector therefor. (Viewed 3 February 2019. F00518). Julio A. Pascucci, assignor to the Miller Company. (30 January 1962; filed 13 February 1958). Letters patent no. 3,019,333; serial no. 714,979: Lighting fixture troffer and latch therefor. (Viewed 3 February 2019. F00519). Frederic W. Ogden, assignor to the Miller Company. (23 October 1962; filed 3 June 1959). Letters patent no. 3,060,309; serial no. 817,779: Lighting fixture. (Viewed 3 February 2019. F00520). Ernest B. Pascucci, assignor to the Miller Company. (30 March 1965; filed 20 June 1962). Letters patent no. 3,176,260; serial no. 203,897: Socket retainer clip for light fixtures. (Viewed 3 February 2019. F00516). Henry Schiffer and Ernest Pascucci, assignor to the Miller Company. (Viewed 4 July 1967; filed 3 February 1965). Letters patent no. 3,329,811; serial no. 430,112: Lighting fixture with interchangeable reflectors. (Viewed 3 February 2019. F00517). Julio A. Pascucci, assignor to the Miller Company. (27 December 1966; filed 19 August 1964). Letters patent no. 3,294,967; serial no. 390,549: Reflector socket mount for lighting fixtures. (Viewed 3 February 2019. F00514). Frederick W. Ogden, assignor to the Miller Company. (9 May 1967; filed 30 December 1964). Letters patent no. 3,319,059; serial no. 422,218: Sectional lighting fixture. (Viewed 3 February 2019. F00513). Henry C. Schiffer and Thomas E. Creed, assignors to the Miller Company. (1 October 1968; filed 26 October 1966). Letters patent no. 3,404,269; filed 26 October 1966: Mercury vapor lighting fixture. (Viewed 3 February 2019. F00512). Offline - Meriden Public Library files. Frank Van Steenhoven and Thomas D. Hirt, assignors to the Miller Company. (31 July 1979; filed 14 December 1977). Letters patent no. 4,162,779; appl. no. 860,596: Outlet box mounting device. (Viewed 3 February 2019. F00511). Online - Courtesy Emily Hall Tremaine Foundation. (Direct to pdf). Yale University library call no. N5220 T78 H68 2001 (LC). Miller Company. (undated). More and better light for industry with Ivanhoe equipment. Approx. 6 pp. (Viewed 28 June 2018. A03006; AAA03376-26). Offline - University of California Santa Barbara library, Special Coll., Romaine Trade Catalogs. Ibid, (pp. 72-3). Miller Company: Meriden, CT.
 Ibid, [p. 38 (1935, vol. 1 mention); p. 76 (1939, vol. 5, no. 1. cover reprint); p. 78 (1943, vol 8, no. 11 cover reprint, 1944, vol. 9, no. 12); p. 81 (March 1946)]. Miller Company: Meriden, CT. Viewed 1 August 2016.